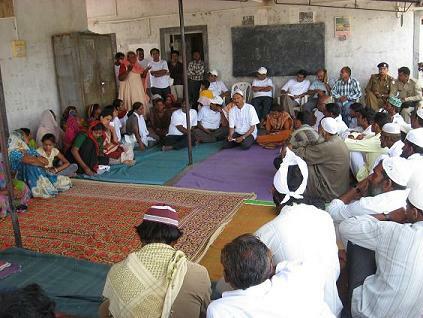 Machhimar Adhikar Rashtriya Abhiyan resumed today with a meeting of the fisherfolk at Junabandar, Mundra, Kutch. Junabandar is one of the oldest but relatively small fish landing centre. Alongwith 7 other landing centres in the area, commanding around 10,000 fisher population, Junabandar has been threatened to extinction by Mundra Port and SEZ and Adani Power which have acquired a 28 kilometre long stretch of coastal land. The story of the land acquisition is itself a pointer to the apathy of the government for conservation and their leaning to big business. The coastal stretch of Mundra had creeks and thick mangrove vegetation even five years back. The business houses first started putting up bunds through their henchmen blocking inflow of sea water. This was a blatant violation of CRZ regulation. The blockage of water inflow killed large parts of the mangroves. Then the business houses moved in to secure formal lease from the government claiming it as waste land. Today large buildings tower over the shanties of fisher people. Heavy construction machinery has ravaged the land. The fish catch has declined sharply with its inevitable consecuences on the local fishing community. The Abhiyan reached Junabandar at around 9 AM. The whole community, men women and children came out of their shanties and the whole place wore a festive mood. The blue flag of NFF was fluttering on the shanties. Defying the scorching sun all of them gathered in a public meeting. Kasem Bhai Machi, the Sarpanch of the local Panchayet welcomed the Abhiyan. Addressing the meeting he described the desperate situation of the fishers. He urged NFF to fight to the last for their survival. Amina Ben, the leader of the neighbouring Trogri Bandar Panchayet spoke of the plight of the fisher women who lack transport to take the fish to market, vending space, clean water and toilet facilities in the markets. The local fishers, particularly the women spoke of the curse brought by the big business. They said that they consider mangroves as members of their family and inseparable from their way of life. But they were helpless witnesses of mangrove destruction. The fishers complained that they were not allowed to fish without fishing passes issued by the customs department. The fees for a pass is Rs. 500/- for a period of six months and to get it one needs to go 40 kilometers away to Bhadreswar a number of times. There is no drinking water, link road, medical facility in the village. The fishers' children had only one informal pre-primary school run by the Yusuf Meherally Centre. There is no electricity in the village though, only a few hundred metres away, the Mundra Port and the adjacent SEZ dazzle with high voltage lamps. NFF Chairperson Harekrishna Debnath explained the context and urgency of the present campaign. He said that the present struggle for survival of the fishers would go a long way not only in protecting their lives and livelihoods but also would secure the future generations and natural resources of the country. He urged the fisherpeople to send at least two representatives from each village to Delhi in July for the march on parliament. NFF national leaders Shri Narendra Patil, Shri Ramesh Dhuri, Smt. Purnima Meher, Shri Bharat Patel spoke on the occassion. Mohammed Usman Gani of Machhimar Adhikar Sangharsh Samity (MASS), Fr. David and other leaders also addressed the gathering. Sri V. Vivekanandan of the South Indian Federation of Fishermen Societies (SIFFS), Smt. Alka Ben Jani of Kutch Mahila Vikash Sangathan and UJJAS leaders spoke in support of the campaign. Sri Noel Kiny and Navel, from the Gorai (Maharashtra) struggle against Esselworld SEZ attended the meeting. The villagers resolved to carry on their struggle to the end. They enthusiastically offered to participate in the march on parliament. As a pledge to protect the natural resources and their livelihood the fishers planted mangroves at the end of the meeting. Ahmed Bhai Machi, a veteran fisherman, led them to take an oath to protect the mangroves, the coastal zone and their livelihood against all odds. The second meeting of the day was held at the Yusuf Meherally Centre at Bhadreswar at 11.30 AM. Around 300 fisher men and women leaders gathered in the meeting from all the fish landing centres affected by the SEZ, Power Plant and Ports in the region. Adam Bhai and Hasam Bhai, the Sarpanch and Deputy Sarpanch of the Bhadreswar Bandar Panchayet; Noor Mohammed, Sarpanch of the Veera Bandar Panchayet and Amina Ben of Trogri Bandar Panchayet spoke in the meeting describing the dire problems faced by the fishing community. Sri V. Vivekanandan of the South Indian Federation of Fishermen Societies (SIFFS), Smt. Alka Ben Jani of KMVS and Deval Ben of UJJAS spoke in support of the fishworkers. Mohammed Usman Gani of MASS, also addressed the gathering. Father David , Sri Noel Kiny and Navel attended the meeting among others. NFF national leader Shri Narendra Patil said that the government is supporting the rich businessmen who are destroying our natural resources at the cost of the poor fishers, who are feeding the country with cheap protein and helping in earning thousands of crores of rupees from fish export without any investment from the government. 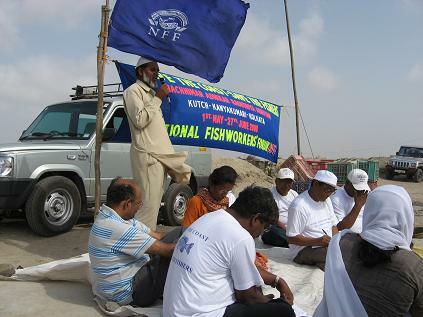 NFF Chairperson Harekrishna Debnath urged every fisher man and woman to stand together in the fight to protect the coastal resources and their livelihood. He said that the need of the hour is to get organized and join the struggle for survival. He asked the fishers if they were ready to send two representatives from each fishing village to the march on parliament in July. The full house raised both their hands in affirmation. In the afternoon the caravan of the Abhiyan joined by fishing community leaders of Kutch left Bhadreswar for Dwarka.